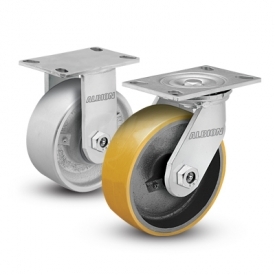 Manufactured from cold-formed steel, Albion 62 Series casters feature heat-treated king bolt and nut, which ensures durability and a longer caster life. Each rig is zinc-plated, which increases corrosion resistance. Zerk fittings in heat-treated swivel section provides easy maintenance. 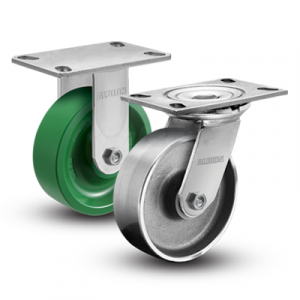 Yoke bases on swivel casters are notched to accommodate optional swivel locks.